Dr. Ravi completed his Undergraduate Medical Degree from Bangalore Medical College at Bangalore University, India (1991 – 1997). He received his Residency in Internal Medicine (1999 – 2003), and his Residency in Radiology (2003 – 2009) from the University Hospital of Wales at Cardiff, UK. 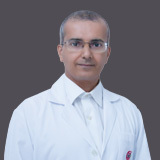 Dr. Ravi was previously employed as a Consultant Radiologist at the University Hospital of Wales in Cardiff, UK (2009), a Consultant Interventional Radiologist and Adjuct visiting professor of Manipal University at Manipal Hospital, Bangalore (January 2012). His area of expertise is in Vascular & Interventional Radiology in Adults and Children, and Cross Sectional Imaging with CT, MRI, and Ultrasound. Dr. Ravi has a Clinical Fellowship in Vascular and Interventional Radiology, Adult and Paediatric Intervention, from McGill University in Montreal, Canada. He is also a member of the ISVIR. Dr. Ravi has several publications, his latest being “ R Gadahadh, D Valenti, M Aljiffry, et al. Surgery and interventional radiology collaborate on combination therapy in hepatocellular carcinoma. US Gastroenterology & Hepatology Review 2011”. Dr. Ravi also has over 10 poster presentations including “How and why to perform a portal vein embolization? R Gadahadh, C Dey, D Valenti, T Cabrera, LM Boucher. Accepted for presentation at the Cardiovascular and Interventional Radiology Society of Europe, Valencia, October 2010”.